Certainty, where none exists is dangerous. Some concepts are well explained. The broken window myth, war stimulates the economy myth, building unnecessary things to stimulate economy myth, etc are great. 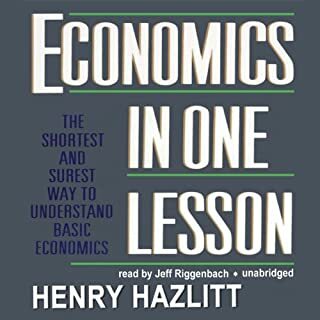 The author starts out to refute "myths of economy", and yet ironically creates and propagates many myths, worse than the ones he sets out to refute in the first place. First fallacy is assuming that economy is a hard science like mathematics. It may be, but all the factors in the equation are not yet fully known. Drawing definite conclusions with many unknown factors is premature. This leads to certainty, where it does not exist and that's the root of many evils. Another fallacy assumed in this book is that all purchases of goods and services and savings lead to wealth creation. iPad is a good example. Watching movie is another. The money spent does not create wealth for the spender. He simply purchases entertainment. The value of goods or services acquired does not remain the same or increase in all cases. The transaction, however, makes the society richer. The ability to purchase such goods, whose value will declines with time is the hallmark of a wealthy society. Another biggest fallacy is the assumption that one billion dollars in the hands of one man in a society of a million people is the same as a range of distribution from, say a hundred to million dollars in the hands of all the million people. While the society has a billion in both cases, 999,999,999 are poor in the first and there's a range in the second with varying degrees of purchasing power. These any many more definite conclusions drawn based on false premises combined with simplicity of explanation make this not merely untrue, but a dangerous book in the hands of few manipulative leaders and a larger herd of unquestioning, uncritical masses. read (listen) very critically. I encourage readers to read or listen to black swan and fooled by randomness. 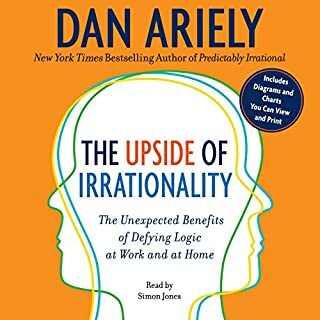 I've read his first book "Predictably Irrational". In that he opens the window to human irrationality and in this book he explores various ways to take advantage of that irrationality. Enjoyable read as well as informative. But this book fell short of my expectations that he set with his first book. He tried to extrapolate the results to unrelated groups under different conditions. For example, he proved in an experiment that under the "acute stress of high reward" an untrained group of individuals performed poorly compared to a similarly untrained group of people who were not pressured by the high reward. And then he goes on to argue that executives and professionals should be paid less. He in fact asks if you would rather be operated on by a well paid surgeon or less paid surgeon, arguing that a well paid surgeon will underperform because of the pressure of high reward (compensation). I guess I should disclose here that I am a physician. I'm in no way supporting the ridiculous pay of this generation of executives, bankers and even some physicians, but I believe this extrapolation is not scientific. I found a few similar misinterpretations. At times, he described his ordeal of recovery from extensive burns in gory details. I am very sympathetic to his suffering and there are times I cried reading it (bear in mind that I'm not stranger to suffering). When looked at it objectively, though, the details were a little more than needed for the narrative. I felt that he invoked emotional reactions, unrelated to the book's narrative. Was he trying to harness the irrationality of the readers? Most observations made in the book appear logical and insightful and his research is commendable. That's all the more reason for him to be as scientifically accurate as possible and not stray. In such a setting, even one unscientific conclusion will cast a shadow of doubt on the validity of the rest. How ever, I do highly recommend, but advise the reader to read it critically. I have read this book when it was released and now I am listening to it. I am enjoying listening to it, just as much as I've enjoyed reading it. It could've been a classic and my all time favorite easily, but for the fact that he resorted to refuting ID/creationism. I guess in the current climate of rampant ignorance and he was compelled to do that. He didn't really need to dedicate any effort refuting the "evidence-deniers", simply for the fact that no amount of evidence could convince them. 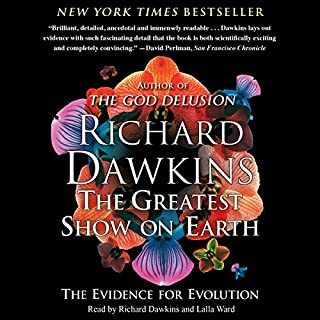 By excluding that <1% time he spent in the book refuting ID/ Creationism, this book could've been just as great as the "Selfish Gene". Prof. Dawkins is my all time favorite author. Ever since I discovered his writings a few years ago, I have been trying to read them all and so far not one of them disappointed me. This book is no exception. Great book. A must read for all students of science and for anyone interested in understanding the nature.